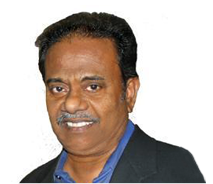 Paul Pandian is currently the Advisor of Tech Mahindra (Americas) Inc., and ex-President, in Dallas, Texas. In 1990 he founded Axes Technologies, Inc. which merged with Tech Mahindra in 2005.Glow Networks, of which he was the Chairman and the majority shareholder, was acquired in 2010 by CSS, Inc., an IT firm. He has wide business interests in India including floriculture, agro products, and media and entertainment. He is a promoter of Shipco, a Logistic SEZ, based in Bangalore. He also serves on the Board of Greater Dallas Indo-American Chamber of Commerce and is a Board Member of TiE (The Indus Entrepreneurs Dallas). He serves on the Advisory Council for the Management School of the University of Texas at Dallas and on the Board of the Institute for Innovation and Entrepreneurship. He is a Board Member of the Dallas World Affairs Council. He has an engineering degree from Annamalai University in India, and he received his graduate business education at the Wharton School of Business.